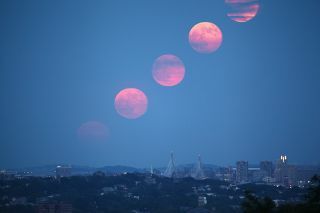 Experienced space photographers Edwin Aguirre and Imelda Joson created this composite view of the biggest full moon of 2013, a so-called 'supermoon,' from a series of images taken as the full moon rose over downtown Boston on June 23, 2013. If you happened to catch the full moon over the weekend, you may have noticed a slightly bigger and brighter display than usual — a lunar view that captivated skywatchers around the world. Dubbed the "supermoon," Sunday's full moon on June 23 was the largest moon of the year, because the moon's full phase coincided with its arrival at perigee, its closest distance from Earth. In spots with good weather Sunday night, the moon offered an awesome sight. SPACE.com readers sent in supermoon photos from across the United States, as well as Canada, Guam, Macedonia, Italy, and other far-flung locales. Veteran night sky photographers Edwin Aquirre and Imelda Joson took this amazing photo of the supermoon full moon rising through haze over downtown Boston on June 23, 2013. "Dozens of people, young and old, gathered well before dark where we were — at Robbins Farm Park in Arlington, which overlooks the city skyline," Aguirre wrote. "They brought blankets and lawn chairs — and their dogs — to enjoy not only the spectacular view, but also the nice, cool evening breeze, which was a welcome relief from the heat and humidity earlier in the day. "In many places, moon watching over the weekend was a big event. Some celebrated the supermoon in style. "Took the kids out to see the supermoon near Las Vegas," wrote Tyler S. Leavitt, whose children dressed in capes and spandex for the occasion. "They had so much fun running around as superheroes as the moon rose." Astrophotographer Tyler S. Leavitt sent in a photo of kids dressed as superheroes watching the supermoon of June 23, 2013, outside Las Vegas, Nevada. The supermoon occurs because the moon's orbit around our planet is not perfectly circular, so sometimes it swings closer than others. When the moon is also full at the time, it creates a vision that's about 12 percent larger in the sky than other full moons. Astrophotographer Giuseppe Petricca sent in a composite image of three views of the supermoon taken on June 23/24, 2013, in Pisa, Tuscany, Italy. In addition, when the moon is sighted low on the horizon, behind trees and buildings, the contrast can create an optical illusion that makes the moon seem even bigger. "The total personal experience is surely wonderful!!" Giuseppe Petricca from Pisa, Italy wrote in an email. "And the 'horizon illusion' makes you really think that the moon is way bigger that the reality." If you missed this supermoon, your next chance to observe an especially large full moon is more than a year away, on Aug. 10, 2014.